Acrylic on canvas (using a screen print method). 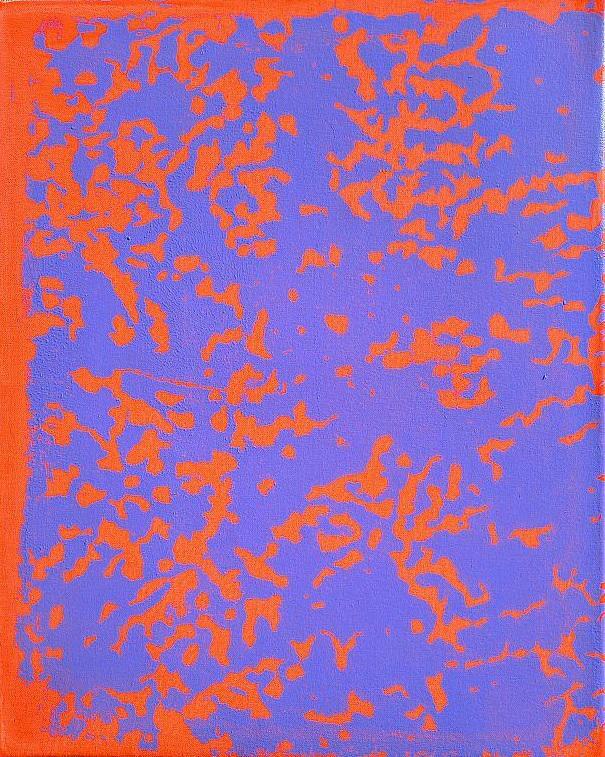 In this new series of 20-by-16-inch acrylic-on-canvas works, the artist used a single screen-printing stencil to further his ongoing investigation of color, surface, process and seriality. Recognized for his deliberate yet improvisational technique and sumptuous, idiosyncratic palette, Maine achieves a beguiling synthesis of chance and purposefulness with these paintings, in which the same all-over composition finds many different ways to sizzle. His critical writing has appeared in Art in America, ARTnews, Art on Paper, the New York Sun, Artillery, Artnet.com Magazine, Hyperallergic.com, and Artcritical.com, where he is a Contributing Editor. Stephen Maine (American, b. 1958) lives and works in Brooklyn, NY and West Cornwall, CT. He is an American abstract painter, writer, curator and teacher, a member of the American Abstract Artists and a contributing editor at Artcritical.com. His paintings engage and extend contemporary ideas about color, composition, surface and process. Maine attended the Rhode Island School of Design, Hartford Art School, the University of Connecticut School of Fine Arts and the Yale Summer School of Music and Art before receiving his BFA in Painting from Indiana University, Bloomington, in 1982. He received his MFA in Visual Art from the Vermont College of Fine Arts in 2014. From 2006 to 2016 he taught in the MFA Fine Arts program at the School of Visual Arts in New York. He currently teaches at the Parsons School of Design and at the State University of New York at Purchase. In a process closely akin to relief printmaking, Maine uses textured surfaces to apply fluid acrylic paint indirectly to prepared canvas. He makes these surfaces or “plates,” some of which are quite large, out of common materials such as plywood, extruded foam, plastic and glue. Maine rolls or brushes wet paint over the plate and presses it into the canvas, using custom built contraptions to ensure alignment (registration) of successive applications. Integral to the process is the idea that the entire surface is treated with paint at the same moment. For Maine that means compositional phenomena are allowed to occur with minimal interference from his ego. This approach to composition is productively at odds with his color decisions, which are closely calibrated. Sometimes a single paint application, in concert with the field of color that is the ground, is sufficient to yield a visually engaging result. In most cases, however, to complete an image multiple layers and more complex interactions of hues are called for. The entire process balances precision and unpredictability. Color itself, and the material properties of paint as embodied color, provide Maine with his primary inspiration. His open-ended and intentionally imprecise production methods yield results that cannot accurately be foreseen, and he delights in the element of surprise they bring to his studio activity. He is inspired by the aleatoric elements of his process, which allows his materials and surfaces to collaborate in the creative act rather than be scrutinized and dominated by the artist. Says Maine; "This work has provided me with a concrete way to think about compositionality, seriality, improvisation, presentation, and the psychology of visual perception." Work by Maine is included in the permanent collections of several important institutions, including that of the Metropolitan Museum of Art, the New York Public Library, the Museum of Modern Art Library Special Collection, the Whitney Museum of Art, Frances Mulhall Achilles Library, the Cleveland Museum of Art and the Yale University Art Galleries, as well as the United States Department of State Art in Embassies Collection. Stephen Maine has exhibited extensively. His work has been featured in numerous solo exhibitions in New York, and group exhibitions throughout the United States as well as in Europe and Mexico.